Save the Children teams put up a tented temporary learning space in Jad'ah camp, south of Mosul. Eager grins light up the children's faces as they jostle at the entrance to the large white tent. We're in the middle of Jad'ah camp, 80km south of Mosul. 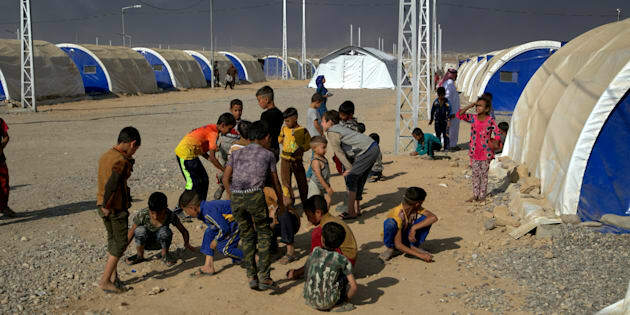 The camp is set up among eerie ghost towns recently retaken from ISIS, with houses scarred by battle, and is currently home to more than a thousand families. It's hot in the sun here, but the evenings are cooling down as we head towards winter. Inside their temporary homes, equipped with nothing more than mattresses and cooking equipment, parents tell us that under ISIS, children weren't allowed to smile at school. They learned that one bullet plus one bullet equals two bullets. They were told to draw tanks rather than trees. They were taught to use weapons and to kill. They were shown violent propaganda films every day. Some as young as 12 were even recruited as fighters. Over a million children -- more than the population of San Francisco, or the entire populations of Birmingham or Adelaide -- have had their education interrupted. They've either been kept away from school by their concerned parents or forced to learn from an extremist, violent curriculum, which pervaded every class. To an outsider, this tent just looks like a simple structure with a few chairs inside, but these children clearly understand the significance of this space. They mime scribbling on their hands and look up at me, asking "Madrassa? Madrassa?" meaning "School, school?" As part of our response to support children displaced by the offensive to retake Mosul from ISIS, we have set up these temporary classrooms as safe and positive spaces for children who have been living under ISIS, many for more than two years. Children between the ages of five and 17 will be taught here in shifts, with girls and boys separated, while the younger ones will be able to play here. Life for these children was nightmarish. Many were exposed to traumatic experiences such as the witness of violent public punishments for people who were seen to have violated ISIS laws, or even family members killed. I learn that children weren't allowed to play in the street. Their craving for fun, recreation and play is evident by their enthusiasm to get hold of a soccer ball brought into the camp by our child protection advisor. Until they get a hold of the ball itself, I hop around and kick stones in different directions and they break into hysterics and copy me. There's huge relief in the camp that life under ISIS is finally over and they've finally reached safety after often long, treacherous journeys. People indulge in a once-banned pastime, smoking cigarettes. One father tells me that as soon as they all reached the camp, the men shaved off their beards. But there's also a sense of restlessness -- the adults just want to work and the parents want to get their children's lives back on track as quickly as possible, through education. There was huge frustration among the parents about having to keep their children from learning for such a long time. "I want my children to get educated, and get a job. The most important thing for them is to read and to write." Education facilitators have now been trained and are running games and activities for the children, before they get started on things such as literacy and numeracy. They'll all need months of catch up classes before they can be reintegrated into the formal education system. These children are itching to get started: they know the importance of education and they've already missed out on enough of their childhoods.